Ambassador Dho promotes tourism, sports and education to fight poverty in the world’s least developed countries. She is spearheading the Thank You Small Library project of the UNWTO ST-EP Foundation which has established over 80 libraries in developing countries since October 2007. From 1982 to 1992, she was a Member of the Korean Delegation to the Inter-Parliamentary Union; between 1985 and 1988, she served as Chief of Staff of the Foreign Affairs and Unification Committee; from 1988 to 1992, she was a Member of the National Assembly; and from 1988 to 1992, she served as Vice-Chairman of the Foreign Affairs Committee and Unification. 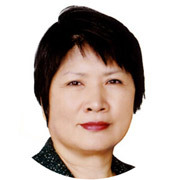 Between 1999 and 2003, she was Vice Chair and Chair of the Organizing Committee for Visit Korea Year; from 2003 to 2004, she served as Ambassador of Cultural Cooperation; and from 2005 to 2006, she was Ambassador of Tourism and Sports. Ambassador Dho holds a BSc in Journalism from the University of Wisconsin and a Masters in Public Administration from the University of Oklahoma. In 2008, she was awarded the title if High Knight of the Order of Merit of the Italian Republic.